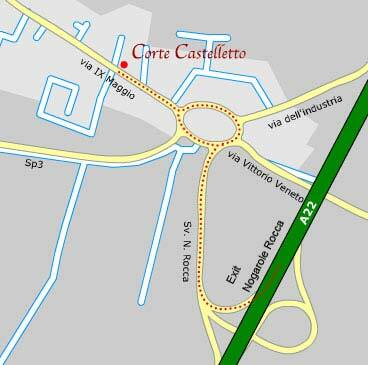 Corte Castelletto is between the cities of Verona and Mantova, near the exit "Nogarole Rocca" of the Brennero motorway A22. By car: Take the Nogarole Rocca exit from the A22 motorway and follow the directions for Pradelle Centro for approx 200 metres. At the exit of the motorway take the 3° exit of the roundabout with the direction “Pradelle” and “Centro” and straight on for 200 meters. By train: From the Villafranca railway station, on the Verona Porta Nuova route (Verona - Mantova), take the N. 57 bus route (Verona - Villafranca - Bagnolo) and get off at "Pradelle". By plane: From Verona’s "Valerio Catullo" airport, rent a car and follow the N. 62 State Road to Villafranca di Verona – Mozzecane - Mantova for 1,3 kilometers. In Mozzecane turn left and follow the instruction for the motorway Brennero A22 (approximately 7 km). Near the exit of the motorway take the 3° exit of the roundabout with the direction “Pradelle” and “Centro” and straight on for 200 meters. Click on the map to see in more detail where we are and how to reach us.